Turn any section of your yard into a hummingbird dining spot using the More Birds 3 in 1 Hummingbird Feeder. The traditional, saucer shape and red color on this item bring a classic look to your yard, while its mounting options offer fantastic versatility. The plastic reservoir accommodates 6 ounces of nectar, and three, yellow flower shapes on its red cap create feeding ports. 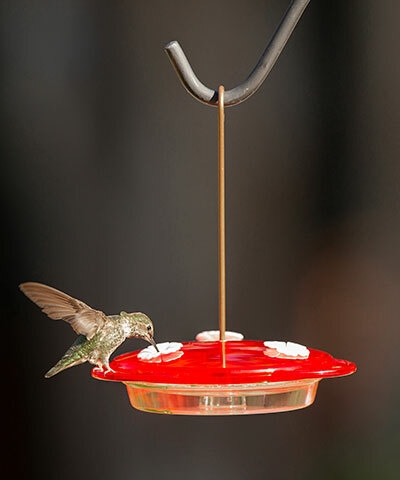 Perches align with each port for hummingbirds to sit and dine, and interlocking tabs keep the lid secured to the saucer. This unique item includes three different mounting options, to situate the feeder wherever it is most convenient for you. A clear plastic bracket attaches to a window with its suction cup, for you to watch hummingbirds feeding right near you. Install the included, 16.75" long, metal stake in your flowerbed and place the feeder atop that for a charming garden addition, or attach the included, 6" long metal hanger to the feeder lid and hang the piece. The cap twists off for cleaning the item and refilling its reservoir, while each mounting option provides a different look in your yard. The plastic feeder remains lovely and functional for many seasons, and is great for beginning birders. Find just the right spot to feed hummingbirds in your garden with this 3 in 1 Hummingbird Feeder.